Captain Seymour Jacob Van den Bergh (or Vandenbergh) was an English officer of the British Army who died during the First World War. He was born on 28 July 1890, in Hampstead, the son of Dutch-born parents Henry and Henriette Van den Bergh (née Spanjaard). His father was chairman of the family margarine business, which later merged with Lever Brothers to form Unilever. 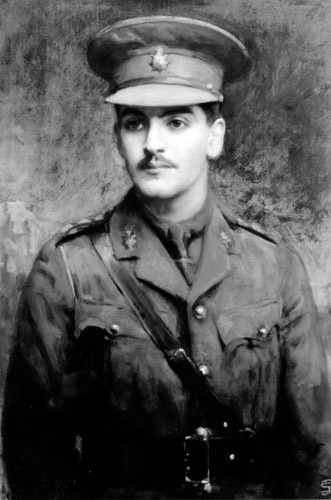 Educated at Clifton and Balliol College, between 1909 and 1913, Van den Burgh was commissioned as a second lieutenant in the Middlesex Hussars in 1915. While serving with his regiment, Van den Bergh died on 27 October 1917, in the Battle of El Buggar Ridge during the Sinai and Palestine Campaign against the Ottoman Empire. He belonged to a detachment holding Hill 720, which came under sustained attack for several hours before being overwhelmed. Just four men were able to escape. He had previously been on the Western Front. His brother, James, died there while a lieutenant in the Royal Field Artillery. He is buried in Beersheba War Cemetery, Israel. ↑ Henry Van den Bergh, britishmuseum.org. Retrieved 5 August 2015. ↑ 'VAN DEN BERGH, Henry’, Who Was Who, A & C Black, an imprint of Bloomsbury Publishing plc, 1920–2015; online edn, Oxford University Press, 2014 ; online edn, April 2014 accessed 5 Aug 2015. ↑ The Balliol College Register 1832-1914, p. 348. ↑ The Cavalry Journal, Volume 20, p. 514. Van den Bergh, Seymour, cwgc.org. Retrieved 18 October 2012. Oil on canvas portrait by Joseph Solomon, RA, archives.balliol.ox.ac.uk. Retrieved 18 October 2012. TheyServed Wiki is a FANDOM Lifestyle Community.